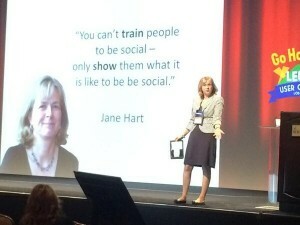 I saw a great quote from a presentation by Jane Hart the other day, via a tweet by Tracy Parish (@Tracy_Parish): “You can’t train people to be social, only show them what it is like to be social.” As usual, Jane is quite right. But, showing is only part of it. Showing the introvert or resolute wallflower what it is to mingle at the office party will not convert anyone to a new behavior. At minimum, a bit of gentle coaxing and some handholding are in order. A more structured ice-breaker or purposeful conversation period would likely go a long way to integrate the cautious. Thinking about how to coax the shy or fearful reminded me of the swimming lessons I used to teach as a teenager. I was given the group of 5-to-7-year-olds who were afraid to get in the water. For them, dangling their feet in the water was an entire first lesson. It was several lessons to build up enough confidence for The Bucket. Each tadpole was given a bucket big enough to fit their heads. Each student filled their buckets with water, and step-by-slow-step we would work together until they could submerge their heads: First one ear, then the other. Then the top of the head. Eventually the face, and once they could do that, the entire head in for 10 seconds. It was amazing the sense of accomplishment these kids felt with their new-found ability to stick their heads in the water and hold their breath. From there, getting into the pool didn’t seem so scary. Social Learning? 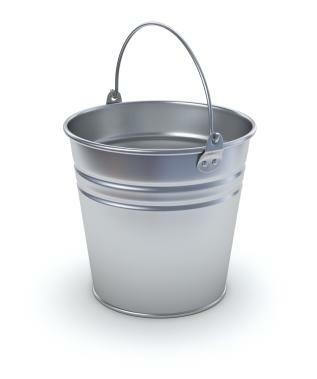 : Get the bucket! All the while, they could see the guppies kicking around on their kickboards and even doing some real swimming – the role model of those little fish was the crucial unspoken motivation. OK, perhaps the analogy is a bit strained, but here’s the point: The tadpoles had the tool (the pool), and the model (the guppies), but there was no way that would be enough for them to get into the pool without the planning and instruction that class provides. I don’t think that social workplace learning is so different. You can tell people about the benefits, provide great tools, and even show them how your vanguard group of social learners use it. But there’s no substitute for putting the structures in place to allow people to experiment in a safe environment. So, even though social learning by nature is without hierarchy or preconceived goals, it will not be as inclusive or ultimately as useful without learning structures – and learning professionals to guide tadpoles in their development into guppies.